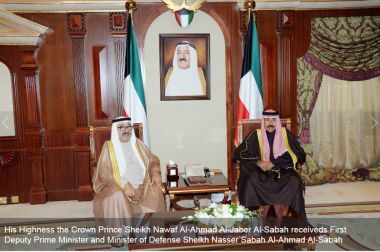 KUWAIT-- His Highness the Crown Prince Sheikh Nawaf Al-Ahmad Al-Jaber Al-Sabah received Sunday at Bayan Palace First Deputy Prime Minister and Minister of Defense Sheikh Nasser Sabah Al-Ahmad Al-Sabah accompanied by Lieut. Colonel Fahad Al-Yagoub, Commander Salem Al-Mail and Major Sheikh Nasser Fawaz Al-Sabah, for entering Guinness World Records by carrying the longest Kuwait flag while skydiving free fall. 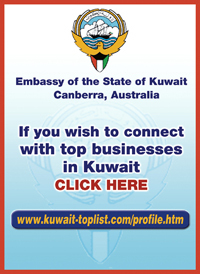 His Highness the Crown Prince praised this achievement and the ability of Kuwaitis to raise the name of Kuwait during regional and international forums wishing them more success and progress. 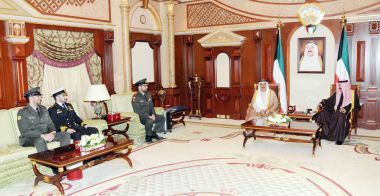 His Highness the Crown Prince also received Deputy Prime Minister and Foreign Minister Sheikh Sabah Khaled Al-Hamad Al-Sabah, Deputy Prime Minister and Interior Minister Sheikh Khaled Al-Jarrah Al-Sabah and Deputy Prime Minister and State Minister for Cabinet Affairs Anas Al-Saleh.